This week i want to introduce you to a couple of awesome manicure and pedicure sets we have managed to acquire. I have personally tried using them and was really pleased with the results. As a pharmacist, I deal with customers and their medications all day and think its extremely important to have clean, smooth and healthy nails. If you are like me, and don’t really fancy sitting in a salon making small chat but still want nice nails then this weeks blog is for you! That little bit extra for foot and nail care. Well-cared hands and feet are crucial for first impressions. With the MPE 100 manicure/pedicure station, you can enjoy professional nail care from the comfort of your own home – the perfect salon-quality nail finish. With the MPE 100 station, you receive a complete kit that can give your nails a natural-looking manicure or make them stand out. For professional nail and foot care. Max. 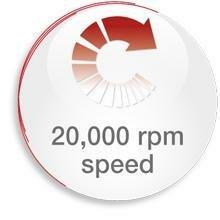 power up to 20,000 rpm. 10 high-quality attachments made from sapphire and felt. 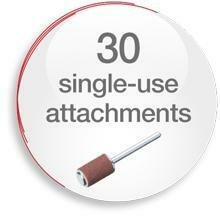 30 single-use attachments made from sandpaper. 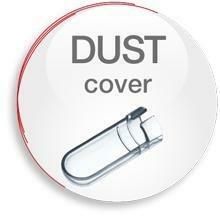 Protective cap for nail dust. The MPE 100 manicure and pedicure station is equipped with 10 high-quality and long-lasting professional attachments. They have a layer of sapphire or polishing felt and are therefore ideally suitable for individual treatment and satisfy the highest standards. The sandpaper attachments are suitable for removing dry skin, calluses on the sole of the foot and heel, and treating the nails. 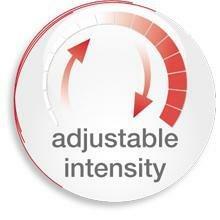 The special feature of the single-use attachments is that they can be removed and disposed of after a single use. 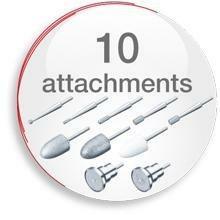 30 single-use attachments are included in the scope of delivery. Position the protective cap while treating the nails to catch the nail dust and stop it escaping. The MPE 100 achieves a maximum output of 20,000 rpm and is therefore also suitable for artificial nails. With the continuously adjustable speed control, professional foot and nail care at the standard of a pedicurist is possible. Select the desired speed using the speed controller. 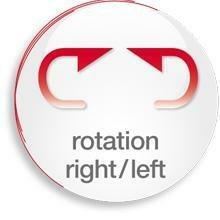 Select the desired direction of rotation using the buttons for clockwise or anti-clockwise rotation.